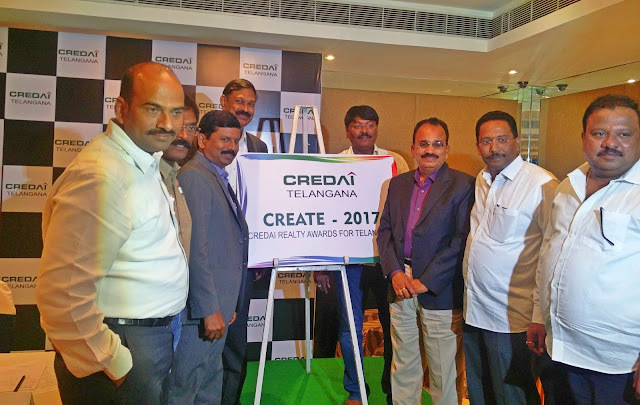 The Confederation of Real Estate Developers Association of India (CREDAI) Telangana is organizing CREDAI Telangana Reality Awards, “CREATE – 2017” to promote and recognize its members for outstanding contribution to the real estate sector during the last financial year. CREATE-2017(CREDAI Real Estate Awards for Telangana) is a platform by CREDAI Telangana, under whose aegis different awards would be given to the members who have exhibited excellence in different facets of real estate activity. The logo for CREATE 2017 was unveiled in Hyderabad in the presence of Mr. G Ram Reddy, President, CREDAI Telangana, Mr.Ch. Ramchandra Reddy, General Secretary, CREDAI Telangana, Mr. S Ram Reddy, President CREDAI, Hyderabad, Mr R K Rao, General Secretary, CREDAI Hyderabad, P Venkateshwar Rao, President CREDAI, Warangal, Ajay Kumar, President CREDAI, Karimnagar, Satish Attal, President CREDAI, Nizamabad, Suresh Kumar V, President CREDAI, Khammam, Suneeth, President CREDAI, Mahaboobnagar, D Venkateshwar Rao, President CREDAI, Kothagudem.